The Trump administration is considering using West Coast military bases or other federal properties as transit points for shipments of U.S. coal and natural gas to Asia, as officials seek to bolster the domestic energy industry and circumvent environmental opposition to fossil fuel exports. It would advance the administration’s agenda of establishing American “energy dominance” on the world stage and underscores a willingness to intervene in markets to make that happen. It’s also tantamount to an end-run around West Coast officials who have rejected private-sector efforts to build new coal ports in their states. A Democratic senator from Oregon and environmentalists blasted the proposal as undercutting local communities opposed to fossil fuel exports. In an interview with The Associated Press, Zinke cast it as a matter of national security to ensure U.S. allies have access to affordable fuels. The Trump administration also has cited national security as justification for keeping domestic coal-burning power plants online to prevent disruptions of electricity supplies. Oregon Sen. Ron Wyden said the Trump administration was “disregarding the realities around climate change” and “trampling on local communities” that have rejected prior port proposals. “The federal government should be doing more to invest in clean, renewable energy, not threatening the health and safety of Oregonians by propping up dirty energy investors,” the Democratic lawmaker said. Groups including the Sierra Club and Northern Plains Resource Council also voiced opposition. 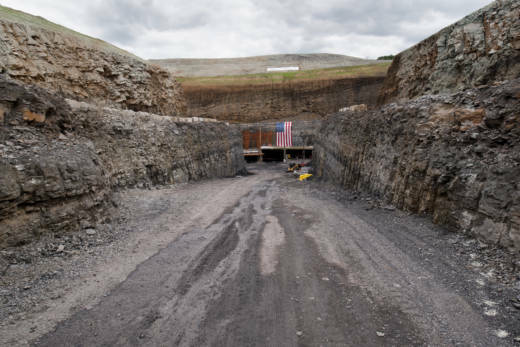 “The military is not a roving force to do whatever Trump finds politically expedient,” said Jan Hasselman, an attorney for opponents of a stalled coal port in Washington state. That’s brought a backlash from elected officials in coal-producing states, who have blasted Washington Gov. Jay Inslee in particular. They argue the rejection of the Longview port, sponsored by Utah-based Lighthouse Resources, violated the commerce clause in the Constitution that says only Congress has the power to regulate international and interstate trade.Montana, Wyoming and four other states joined Lighthouse Resources in a lawsuit challenging the rejection of the company’s Millennium Bulk Terminals port, which could handle up to 48.5 million tons (44 million metric tons) of coal a year.Rep. Liz Cheney, a Wyoming Republican, said she’s spoken with Zinke and U.S. Energy Secretary Rick Perry about using federal facilities to circumvent opposition to proposed ports. Coal exports to Asia more than doubled in 2017, according to the Energy Information Administration. The rise continued in the first half of 2018 with almost 23 million tons of U.S. coal exported to Asian nations through June. South Korea, Japan and China were among the biggest recipients. “We’re bit players on the global stage,” Williams-Derry said.